Summary: "Alice Love is twenty-nine, crazy about her husband, and pregnant with her first child. Ultimately, Alice must discover whether forgetting is a blessing or a curse, and whether it’s possible to start over." Review: What a lovely novel. If you're in the mood for a character driven, adult contemporary novel, please do consider Liane Moriarty. This is the second of her novels that I've read (the first being Big Little Lies) and I enjoyed both immensely. The best thing about Moriarty's novels are her characters. Each one comes to life in a unique and natural way. I loved so many of these characters and wanted them to be happy, each for different reasons. Alice is in such a unique position, forgetting the past decade of her life, and I was completely captivated watching her sort through and figure out her body's reactions to people and places and things of which she has no memory. It would be so terrifying to wake up and discover that you have three children, none of whom you have any memory of whatsoever. I can't even imagine waking up to discover that I was in a nasty custody battle with my husband who, according to me, I was madly in love with. Alice is surprised by the person she's become. She is better in some ways, but Alice isn't so sure she likes this new version of herself that everyone else expects her to be. Her journey begs the questions of the reader, if your ten-years-ago self were to meet your current self, what would (s)he think? Would (s)he be pleased? Impressed? Satisfied? Or confused, and possibly even upset? What decisions are you making now that will determine your life's trajectory? What can you do to bring yourself peace in the future? All this self-reflection can be exhausting, but I think it is useful to think about every once in a while. I certainly had some revelations about myself that this thought process uncovered, and I've enjoyed the conversations with loved ones that it has spurred. 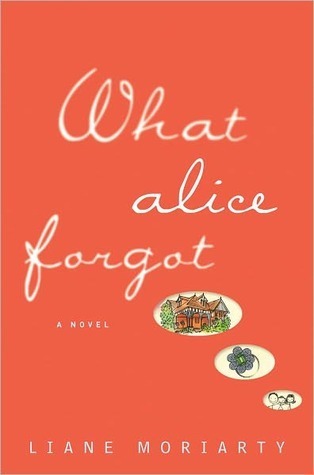 Although Alice is certainly this novel's protagonist, there are other characters and other issues that get plenty of page time. Elizabeth's descriptions of what it's like to live with infertility was so incredible and poignant. There was also several interesting scenes where separated parents try to co-parent, and the unique difficulties that arise from that specific arrangement. Death, bullying, divorce, and family were all big themes in this book, but don't let that scare you! I'm always amazed at the amount of humor that Moriarty infuses into her work, especially given the serious subject matter. Make no mistake, I laughed out loud so many times reading this. Really, it's hilarious. I blew through this novel, and I'm so glad I read it. I loved this thought-provoking and funny story, and can't wait to get my hands on more Moriarty. Bottom Line: A wonderful and moving and hilarious novel about memory, identity, choice, family, and love. Highly recommended! Ok. I've been eyeing this one forever. I'm going to just read it. And soon too. Thanks for the review. The synopsis intrigued but now I'm sold! This is going on the TBR list! Yay!! I hope you love it! !